A group of Seneca County officials is to hold a press conference at 11 a.m., Oct. 31, at the Public Safety Building, 126 Hopewell Ave, Tiffin. The purpose of the press conference is for department heads and office holders to urge citizens to vote against state ballot issue 1. There will be a brief period of time for each of the officials to read their statement. Afterward, everyone will be available for questions. We need your help to get this information out to the voters! We expect to have representation from the county commissioners’ office, the prosecutor’s office, Seneca County Common Pleas courts, the sheriff’s office, the auditor’s office, the opiate task force and from other organizations and departments. Issue 1, according to the measure’s text, was designed to reduce the number of people in state prisons for low-level, nonviolent crimes, such as drug possession and non-criminal probation violations. Several county organizations already have publicly stated opposition to the issue. On Sept. 25, the county commissioners joined several organizations by opposing Issue 1. All four Tiffin and Seneca County judges released a statement summarizing their position against Issue 1. 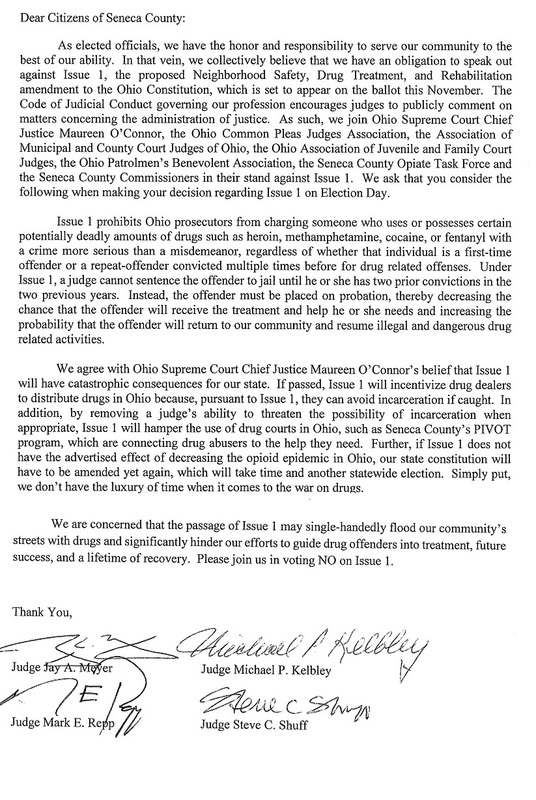 The Seneca County Prosecutor’s Office released a brief statement opposing the ballot issue. The Seneca County Opiate Task Force released a statement opposing Issue 1.